After my first Reading in Style post, I was keeping an eye out for more book, library or reading-themed posts, and much to my delight, so many lovely ones were posted by many of my favourite (and in some cases newly discovered) bloggers (p.s. If you'd like one of your bookish posts to be featured, email me! I'd love to include you in the next one!). I love this photo of Ale from Rosaspina Vintage. It is so whimsical and fun, and everything from her tights to the cover of the book are sprinkled with spring flowers. So pretty! I initially found this photo of Federica on Pinterest, and whoever pinned it didn't source the image (tsk tsk!). With help from a friend (Thanks Alli!) I was able to track down (and end up following) Federica's beautiful blog, which actually is as Sweet as a Candy. So pretty! 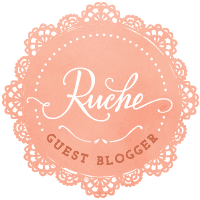 Coury's blog, Fancy Treehouse, has been one of my favourites for a while. I love this shot of her reading one of the beautifully cloth-covered Penguin Classics. I'm not even kidding when I say it's a goal of mine to collect all of these pretty books - lovely! I discovered Marguerite's blog via a post by Rebecca from The Clothes Horse. I think what drew me to this photo in particular was the fact that this very thing has happened to me many times (although I'm aware that this is very likely a staged shot). 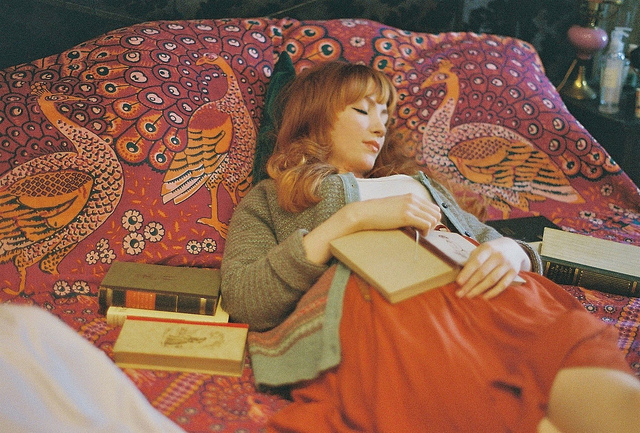 Drifting off to sleep while curled up on a bed reading a pile of good books? Sounds like a good afternoon to me! 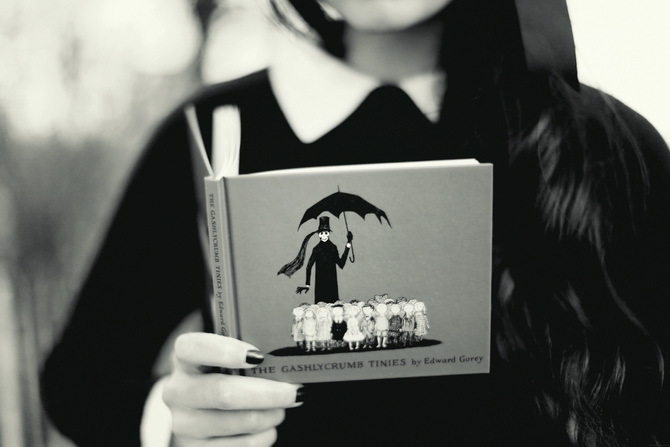 Alix of The Cherry Blossom Girl featured in my last Reading in Style post but her post inspired by Gorey's "The Gashlycrumb Tinies" was too perfect not to share. I sadly missed meeting Janis of Dress Me Dearly by about a week and a half, since she visited Ottawa from Edmonton to cover fashion week just after I moved home to PEI. These might be my favourite photos because not only is she reading in style, but she's actually in a library! So perfect. Hannah of Hannah & Landon has been one of my inspirations for a long time. She's a fellow redhead, stylish in the most romantic of ways (Not to mention the talented creator behind The Loved One) and consistently blogs the most ethereal and absolutely lovely photography. This shot of her reading is one of my all-time favourites for so many reasons. 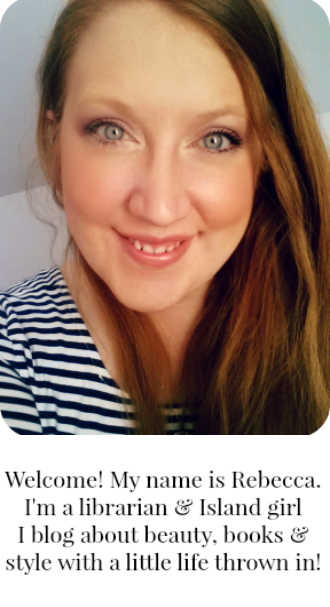 Last but certainly not least, Christina of For Show, whose blog I discovered thanks to Lydia of Style is Style. 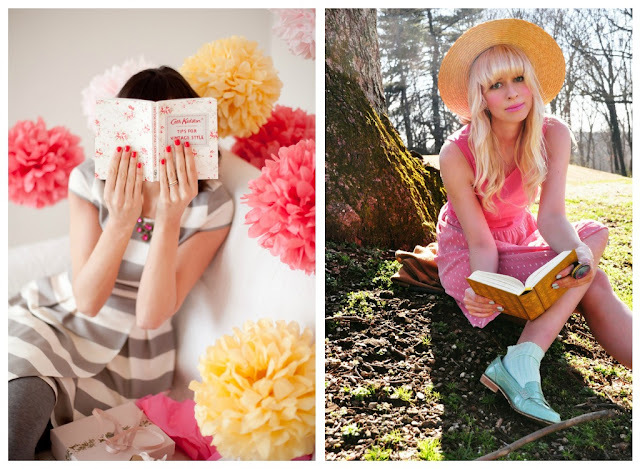 I loved her whole book themed post, pretty polka-dotted dress and perhaps most of all? That perfect pair of glasses = win. Have a bookish style post you'd like to share? I'd love to feature it in my next Reading in Style round-up. 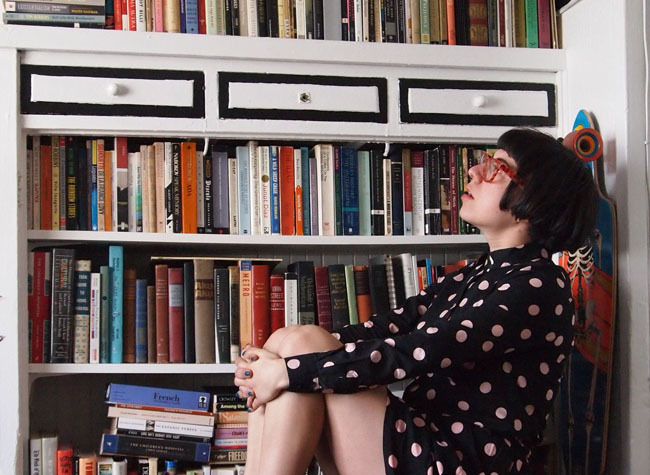 Submit your reading style by sending me an email at rebecca (at) lotsixtyfive.com. Oooh thank you my dear!! So flattering to be featured on your lovely blog and with all these beautiful ladies! Thanks SO much for including me! 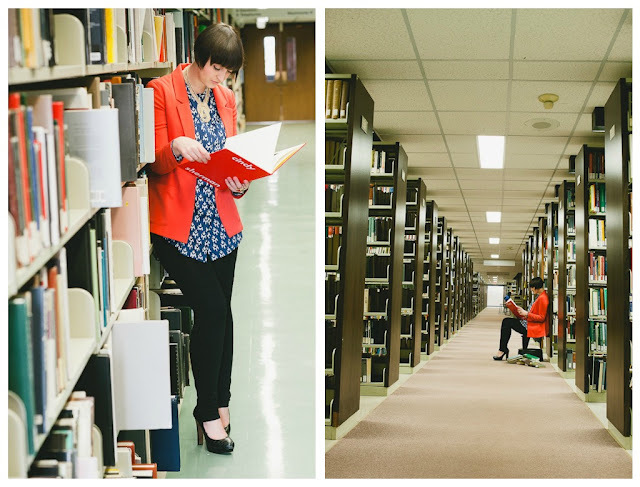 This is sooo inspiring, so many beautiful book themed photos. Great round-up! Hannah, Ale, Marguerite... so many favourites here! I just discovered this...you've put me in wonderful company, thank you! Aw super cute photos! Thanks for sharing! I love those photos of Janis! So sad that you missed getting to meet her. She is such a sweetheart!